Recently people are spending more time outside, accordingly the use of OOH marketing has increased. Outdoor marketing composed 6.7% of global ad spend in 2017. One Nielsen survey found that 46% of US residents use search engines or forms of social media to look up a product after being exposed to OOH, making it an invaluable resource. The world around us can influence tens of thousands of buyers in seconds. The iconic Times Square and Akihabara glow with lights of dozens of digital billboards. One advert placed on the New York Metro, London Underground, Taipei City Metro or the Tokyo Metro could reach millions of people a day. One of the challenges to constructing excellent OOH advertising is that adverts are usually only seen for a few seconds; therefore the advert must draw attention quickly and be memorable. Astute marketers must consider OOH as the hook to entice the curiosity of the potential customers. DOOH (Digital out-of-home) media is one of the most popular forms of OOH due to its bright and colourful displays. Moreover the ability to quickly change between similar displays advertising the same product makes it dynamic. In recent years acquiring OOH has become programmatic; purchasing systems are rapidly being automated. A set fee will result in a number of screens, locations or views. This allows the business to hone the specifics of their marketing strategy based on triggers such as the time of day, weather or location of each billboard. One company, foodora, was able to triple their pick-up service at several restaurants within a few months of implementing trigger based programmatic DOOH. Adding an interactive element such as QR codes that offer special rewards would be another way of engaging with the potential customers at a personal level, consequently helping them to remember your brand. 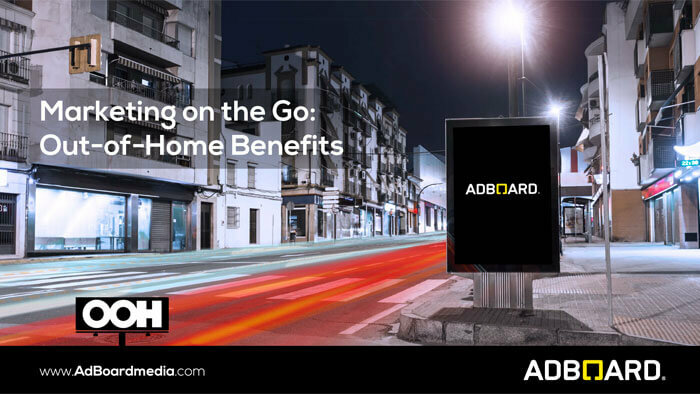 Employing OOH or DOOH in one’s marketing strategy is something all businesses should consider if they have the capabilities due to the many opportunities it offers to reach both a wider audience and pinpoint a target audience very exactly. It should not be one’s entire marketing strategy, but it should be an integral portion of it.